At the request of our members and like-minded homeschoolers, we are adding Outdoor Immersive Learning (aka Forest School) options to our Enrichment Program. We are removing barriers and walls while encouraging confidence and decision-making. These new programs targets children age 3 to 12 years in a blended “leader and leaner” outdoor program. 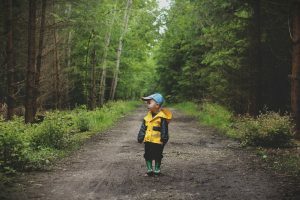 This is an all-weather group where children can explore nature, take guided risks, learn about plants and ecosystems, and be outside the four-wall setting. We will explore the woods together, dig, construct, climb, create, discover, and all the while we will be learning to make smart, educated decisions about our actions. Our facility has ample wooded areas and a pond. An indoor learning space will be available for days when the weather prohibits safely learning outside. Parents of children under age 5 will be asked to remain onsite in our waiting room. Visit our Fees page to learn more about pricing and schedules. We will be “strewing” potential elements of narrative (e.g: a small lean-to; figures made of sticks and twine and glitter; a little village of acorn houses, etc.) through the woods in order to encourage the creation of mythology around the elements. Following a common narrative throughout the year and adding to the narrative as new elements are created by the children and mentor(s). Children will be allowed to climb to heights that feel dangerous (and exciting!) but are in fact safe, with guidance and spotting until they can discern on their own how far they can go safely. Children will be allowed to touch plants and animals that are safe, but they will not be allowed to touch dangerous plants and animals; they will be taught to discern which are which. Introduce scientific vocabulary that will strengthen their understanding of root meanings, so they can start to make the connections between Latin, Greek, and modern English. Explorers will be exposed to the same self-awareness ideas as their peers indoors. As the children advance in the co-op, having these common early co-op experiences will help them bond with the other students. Learn how to work together to accomplish common goals. Encourage a thoughtful and mature response to conflict. Meghan Hayes is currently pursuing National Geographic Educator Certification. She is a lifelong organic, permaculture gardener and naturalist. Through her vocation as a gardener and landscaper, she has spent her adult life observing and learning about the connections between soil life and composition; minerals; plant compounds; plant health; and animal life, movement, and activity. While working as a gardener and stonemason on an estate in North Carolina, Meghan had the opportunity to work with a Lakota tracker. The tracker helped Meghan learn to hone her eye for signs in the environment of recent activity and to discern environmental details. Through studying permaculture, Meghan learned that “The problem is always the solution,” and this self-sustaining principle has ended up guiding most of her activities, including raising and teaching her children.